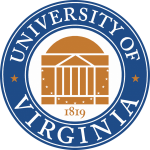 The University of Virginia was founded by Thomas Jefferson in 1819. His wishes were to provide a publicly-supported school that had national character and stature. It has a beautiful University hospital which helps to train some of the country’s leading physicians. 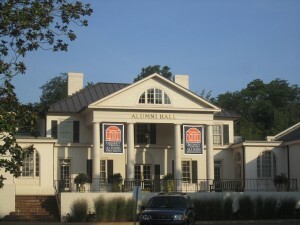 The school’s official colors are orange and blue. The University of Virginia has eleven schools that all offer both undergraduate and graduate programs. 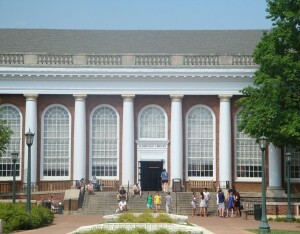 The University of Virginia has been one of the top-rated state universities for a few years running, mostly because of their wide offering of academic programs. Students can choose a program in Law, Education, Medicine, or Public Policy, just to name a few. These programs are taught by invested professors that are willing to take the extra time to ensure that the student is getting the most knowledge out of their classes. There are also graduate programs in many fields of study that can help to give the student more hands on learning. Admission to the University of Virginia is very competitive, with over 90% of admitted applicants being in the top 10% of their high school class. Enrollment has been increasing steadily with a record high of 21,511 applications for the class of 2013. Tuition is lower for both in and out of state students than most other top ranked universities. For an in-state student, first time tuition fees are approximately $11,800 and out of state student’s tuition is approximately $36,800. There are other fees as well including room and board, book and supplies as well that prospective students must keep in mind. There are a variety of scholarships available including the Jefferson Scholars foundation which offers full four year tuition scholarships based on regional and international competitions. There are many different libraries at the university which provide the student with a place to quietly learn, check out digital materials and research. 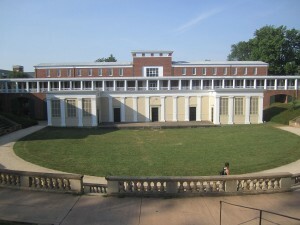 The original design of the school is the unique Jeffersonian architecture. This design revolves around the “Academical Village” which describes the specific are of the Lawn which is a grand area of green space that is surrounded by residential and academic buildings, the gardens and the range. The school grounds also house the Fralin museum which provides special exhibitions of art collections from around the world. There are many extra-curricular activities that students at the University of Virginia can partake in including fraternity or sorority life- this can be an excellent way to meet new people on campus. There is also the Learning in Action program which is dedicated to connecting students with academic community engagement. Volunteerism is a large aspect of the school, with the University of Virginia having sent many students to be workers to the Peace Corps. One of the largest events for university of Virginia students is called Springfest which features a large free concert and a variety of games. The Mascot of the University of Virginia is a cavalier, which is also referred to as a “Wahoo”. There are many different sports to choose from at the school, from baseball to rowing. The University of Virginia’s athletic programs competes in Division 1 and the school has been a member of the Atlantic Coast Conference since 1953.There are also skilled coaches and trainers that will help to support and condition upcoming athletes. The Cavalier Song is the official fight song of the University of Virginia. The University of Virginia boasts many notable alumni, including pioneer transplant surgeon, J. Hartwell Harrison. Journalist Katie Couric is also a graduate, as well many famous athletes including professional baseball player Ryan Zimmerman. There have also been numerous political leaders who have attended the University, including the 28th President of the United States, Woodrow Wilson.